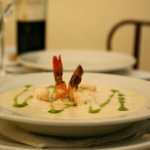 The National Vichyssoise Day is a food day observed on November 18. Vichyssoise is a thick creamy soup which is believed to be either of American or French origin. Vichyssoise is made of chicken stock, cream, and puréed vegetables (leek, onions, and potatoes). It is typically served cold but can be eaten hot as well. The soup was named after the French city of Vichy. The origins of Vichyssoise are questionable. Some are convinced that it is an American invention while others believe that it was first made in France. However, almost everyone agrees that it was re-invented in the United States by Louis Diat. Diat was a French chef at the Ritz-Carlton in New York City. If you want to celebrate The National Vichyssoise Day, you don't have to visit the Ritz-Carlton. This soup can be made at home. Chop 2 leeks and 1 onion, then gently sweat them in 2 tbs unsalted butter until soft. Do not overcook and let them brown. Add 3/4 cup thinly sliced potatoes and 2 1/3 cups chicken stock to the saucepan. Add salt and ground black pepper to taste. Bring to the boil, and summer very gently for half an hour. Purée in a food processor or blender until very smooth and let the soup cool. Gently stir in 1 1/8 cups heavy whipping cream before serving.